My sister did a month in oz, couple years ago, she traded vacation, in FL, at her FL condo, for one in Sydney (each paying their on way.). Sister stopped over in Fiji, for three days, each way, she talks about and enjoyed Fiji, at least as much as oz. She said next time, she might just skip oz and spend more time in Fiji. The woman she traded vacations with, showed her around oz and sister did same for her in FL. They're both good cooks, so ate mainly at "home", but each got to taste new to them food. They became friends, before and after trip and will likely remain so. Maybe you can find someone in oz, that likes MT and work out similar trade. When you don't have to pay for room or car, it cuts trip cost way down. Sister goes to HI several times year, by trading condos, with someone wanting to see the big Mouse and other FL parks. To me, staying with person and having host as tour guide, would be best, but once you knew area and was comfortable with it, trading houses, would be ok too. This sounds like a great option for folks who as you say get familiar with an area - definitely something to consider! Interesting that you mention Fiji - during the entire 13-hour flight, the one thing we saw from the sky was a little island off of Fiji - I thought it was pretty cool to see from so far above! During our stay in Australia, The Beautiful Mrs. Tas and I stayed at the Pier One Sydney Harbour, and in all honesty I do not think that we could have asked for a better place. The location of this hotel used to be a major center for commerce and trade, and is truly an historic building with little treasures to be discovered here and there for anyone who is interested in the past. Even in our room, you could see planks and iron fixtures in the ceiling which pointed directly to the rich history of this unique and important building. Simply put, our stay was awesome. Every member of the staff was friendly, helpful and accomodating; we felt as comfortable there as we would have had we been staying with a valued friend of beloved family member. Our room was clean and the amenities were excellent and thoughtful without being over-the-top. The view from our room looked straight up at the famous Sydney Harbour Bridge, while the view from the pier offered stunning views of Sydney Harbour and the city skyline that took one’s breath away, both day and night. Due to a variety of factors, most of the meals that we ate in Sydney came from the kitchens of the Pier One Sydney Harbour. The main restaurant, The Gantry, had its own menu, as did the lounge. On the pier just outside of the hotel was an on-site “food shack” called The Kerrigan, which featured a charcoal grill and smokery. To be honest, we often never really knew from one meal to the next which kitchen we were getting our food from, as we ordered from various menus, including a general "room service" menu; however, this is no great matter, as all of our meals were very well-prepared and presented...and tasted great! From what I can see, the menus at the Pier One are in a constant state of rotation in order to remain fresh; however, here is what we enjoyed, in an order that loosely corresponds to when we tried each dish. We'd be hard-pressed to choose any favourites, but we did order some menu items more than once. I missed getting photos of each and every meal, but I was able to get at least one photo of everything that we tried. My descriptions are as close to accurate as possible as I neglected to take photos of the menus, but I did try to get a few words down as I experienced each dish. 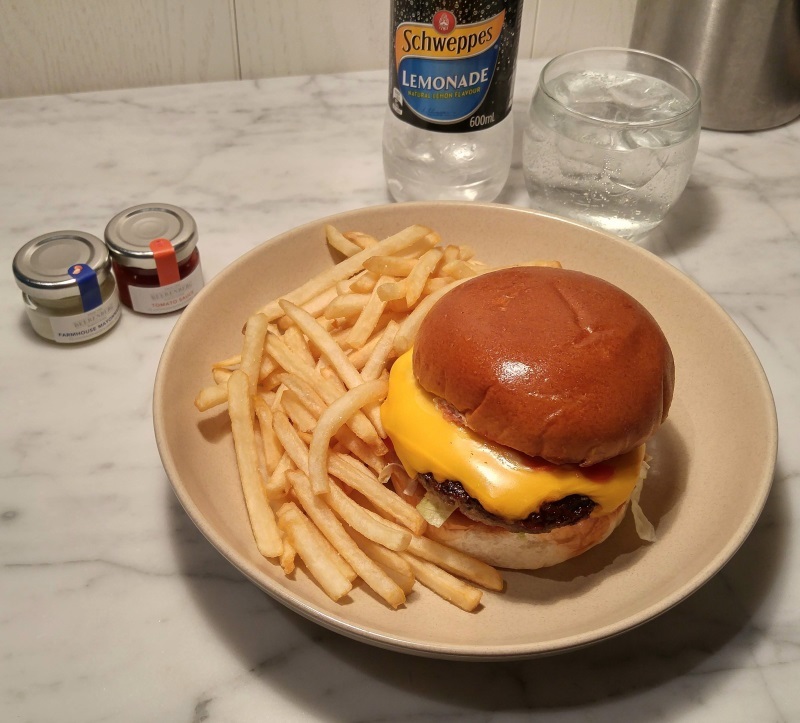 It may sound a little eccentric for Americans to go to another country and then order "a cheeseburger and fries" - however, from what we could see, burgers are quite popular Down Under, although they are usually dressed with ingredients that would be somewhat unfamiliar in the U.S. 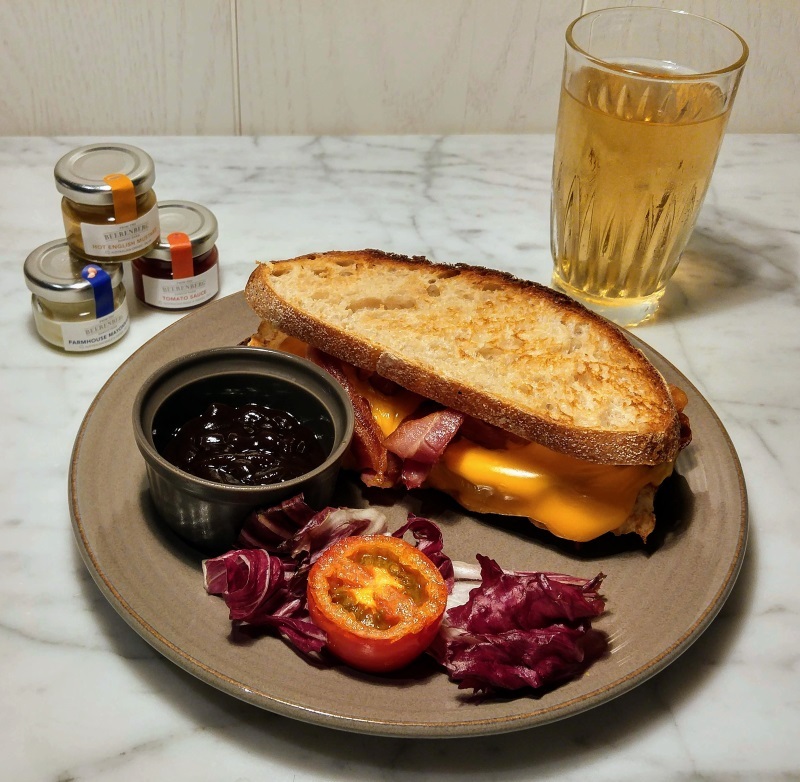 This "Aussie Burger” was flame-grilled and covered with melty, creamy, tangy cheese and dressed with - among other things - cabbage and sliced, canned beetroot. It was served with mustard, mayonnaise and "tomato sauce" on the side. I found the tomato sauce in particular to really be wonderful stuff; it is similar to catsup, but not nearly as sugary and acidic. Part of the base for Australian tomato sauce is meat stock, which in my opinion provides a flavour profile that accentuates the spices within. I really enjoyed it, actually preferring it to catsup, and made sure to order some for myself as soon as we returned to Montana. The chips were also very good; crisp outside, fluffy inside and expertly salted to bring out some amazing flavours. the ones pictured above were a little lighter in colour than the typical examples that we received with our orders, but no less delicious. While I was enjoying my Muesli, The Beautiful Mrs. Tas was feasting on Eggs Benedict dressed with a wonderful, small, grilled tomato, cabbage and some other leafy green that I assume was a variety of lettuce. This type of grilled tomato turned up here and there in many of our orders and was very good, with its naturally rich flavour heightened by the grilling. 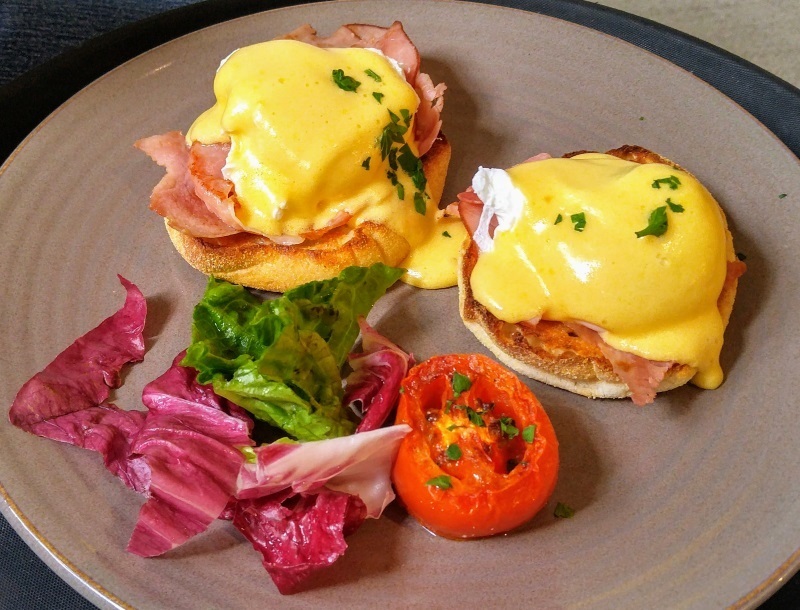 The Eggs Benedict was even better, with a perfectly-toasted English muffin, smoky Canadian bacon, poached eggs and expertly-prepared Hollandaise sauce. 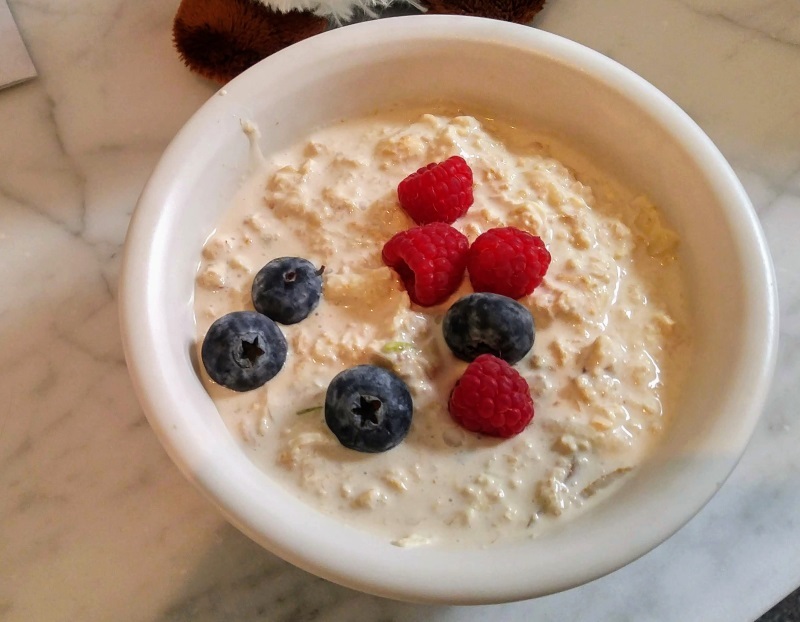 She allowed me to sneak a bite from her plate, and as much as I enjoyed my Muesli, I found myself wishing I had ordered this, instead! 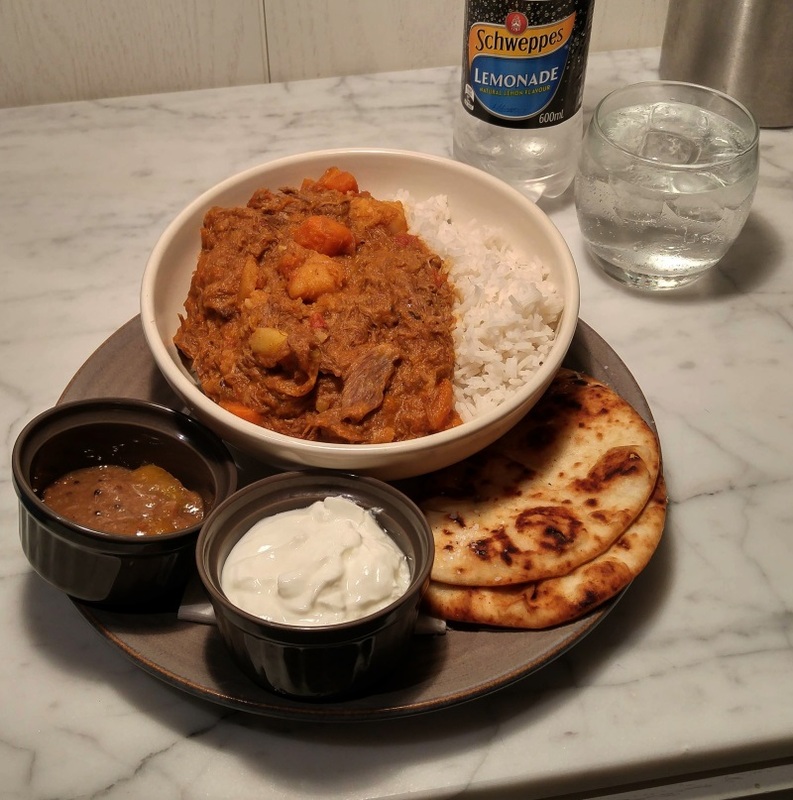 This was actually my first time ordering a traditional "curry" dish, so I was relatively unfamiliar with it and not sure what to expect; consequently, I unfortunately don't have much to say about it from a technical aspect, but I can certainly declare that it was good! The slow-cooked lamb shoulder was seasoned very nicely, neither too spicy nor too bland, and prepared with what I believe were onions, potatoes and sweet potatoes. The curry was served with naan bread, yoghurt and a chutney that seemed to be based on pickled citrus fruit, most likely lemon, but possibly lime or a combination of lemon and lime. I was very impressed with this, and found it to be an outstanding introduction to this type of food. We found this on the room service menu, which you can use to order breakfast; you check off what you want on the card, hang it on your door and go to bed. Then, the next morning - as if by magic - the food appears at almost exactly the time that you requested it! When The Beautiful Mrs. Tas and I saw this breakfast sandwich on the card, we both knew that we had to try it as we often make a much simpler version at home, served on plain bread, bagels or English Muffins. This sandwich, I believe, used toasted sourdough as a shingle, and it was a very good choice. Each was contained a generous portion of smoky, thick-cut, delicious “streaky” bacon along with egg and cheese. In a unique (to us) twist, the sandwiches were served with a delicious, deeply-flavoured, house-made barbecue sauce on the side that really added to the experience. To top it off, our breakfast was served with what was arguably the best apple juice either of us have ever had, and I do not say that lightly. We both tried the juice at about the same time and had to actually stop and do a double-take, as it was that good. I thought maybe it was just me, but The Beautiful Mrs. Tas herself exclaimed how good it was, so I knew I was not alone. Now would probably be a good time to mention something that happened with this breakfast. Along with the sandwiches, we ordered "a side of bacon" for each of us since - let's face it - we love bacon. We were expecting two or possibly 4 slices of bacon each; the usual, rather-thin bacon that we almost always get at most restaurants in the U.S. However, when the breakfast arrived, our "side of bacon" was in a rather large oval bowl serving, piled embarrassingly high with wonderful-looking, crisp, thick-sliced bacon; I would not be surprised if there was a full pound of bacon there - perhaps even more - and it was very good, very smoky and possibly one of the highlights of the whole trip. We couldn't possibly eat it all during that sitting, but we did keep the leftover bacon covered and in the mini-refrigerator that was in our room, to snack on throughout the remainder of our stay. Who could ask for anything more? One evening, we decided to order an late-night snack and selected these items from the menu. I ordered the tandoori lamb and chicken, while The Beautiful Mrs. Tas order the "chook" (chicken) strips. 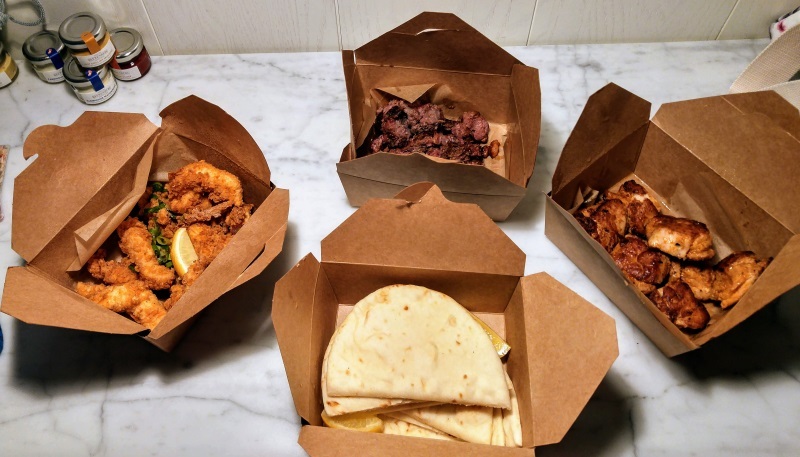 Once again, we were expecting fairly small portions; once again, we ended up with quite a but more than we bargained for...and once again, the food we got was absolutely delicious! The spicy, barbecued lamb (top middle) and chicken (top left) tandoori were wonderfully seasoned with a plethora of spices and cooked on skewers in a tandoor. The lamb was served with a unique and wonderful mint sauce, while the chicken was served with a refreshing cucumber-and-yoghurt sauce reminiscent of Greek tzatziki. The chook strips were seasoned, breaded, deep-fried and delicious tenders of pure chickeny goodness. At the bottom of the photo is the naan bread that came with our order for serving, and in the top-left corner are the usual, now-familiar and beloved condiments that we received with many meals, mustard, mayonnaise and tomato sauce. We were each able to try a generous portion of everything and found it all to be great, with no exceptions. Neither of us had ever tried Wagyu before, so we figured that since we were on the best vacation of our lives so far, we might as well splurge a little and give it a go. This particular beef is certified to have been raised and slaughtered in Scotland, and was of truly top quality, in my opinion. It was seasoned simply, with salt and pepper, and grilled perfectly over a charcoal flame with a sensational sear until just medium. The Café de Paris butter was also a new experience for us; I don't know much about it, except that it is a sauce that was made popular in the 1940s by the Café de Paris restaurant in Geneva, Switzerland. The exact, original recipe is a closely-guarded secret, but is reputed to include fresh thyme and thyme flowers, full cream, white Dijon mustard, butter, salt, and pepper. 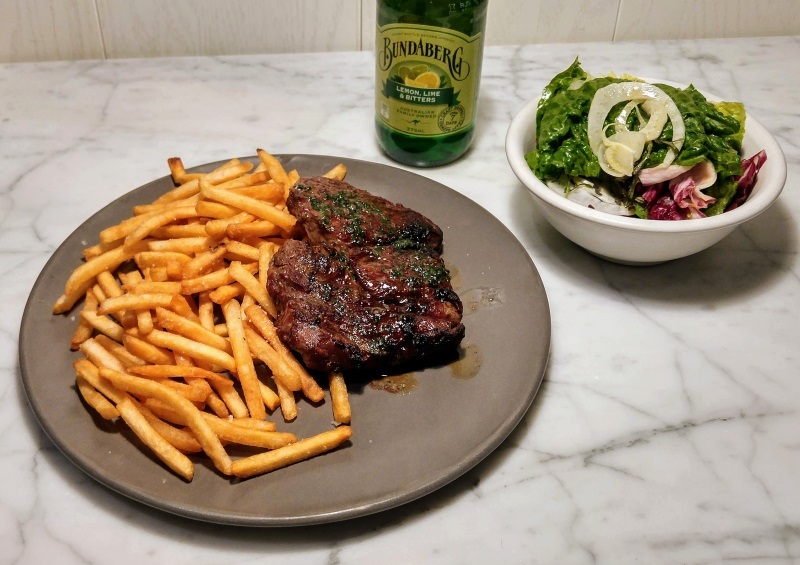 The version that we had is probably not quite as elaborate, and I am guessing that it was a compound butter that included a few herbs and seasonings beyond the original; however, it was extraordinary. Café de Paris butter is reputed to be a nearly-perfect accompaniment for grilled beef, and I am in no position to disagree, as I found it to really be something special. 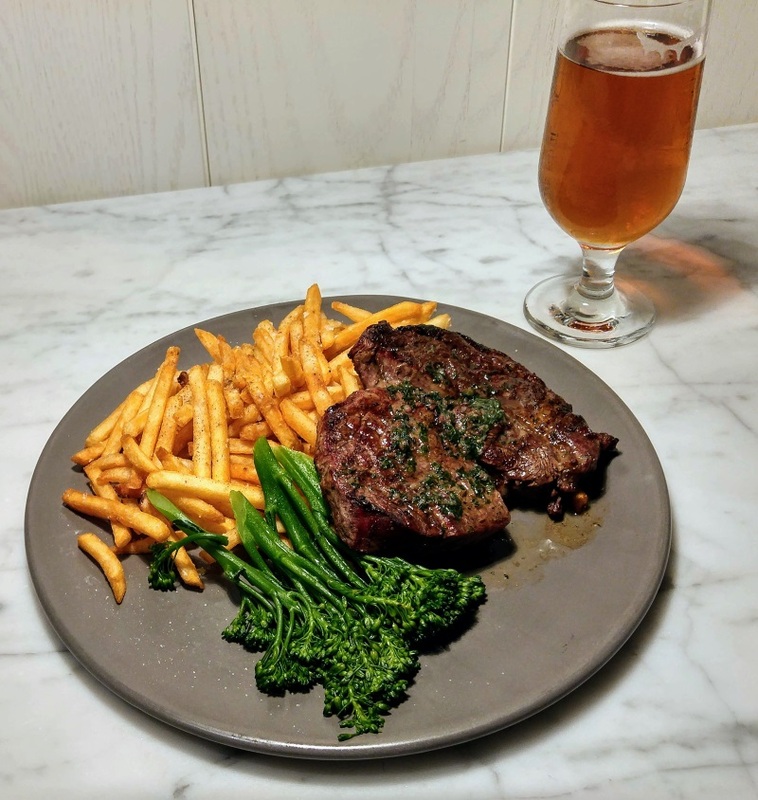 The Beautiful Mrs. Tas ordered her meal with a side salad, while I opted to try the broccolini, which is something else I had never experienced. Both meals were served with more of the wonderful house chips, which might possibly be the best in Sydney. In the top-right corner of the bottom photo, you will see a glass of the excellent beer that the lounge had on tap, Alpha Pale Ale, from Matilda Bay Brewing Company. Neither The Beautiful Mrs. Tas nor I order desserts very often; however, we received this dessert as a complimentary gift from the house, due to some very minor (in my opinion) confusion over our order. I don't know much at all about it, except that for a guy who loves lemon meringue pie, this was absolutely exquisite and possibly one of the best desserts I've ever had. 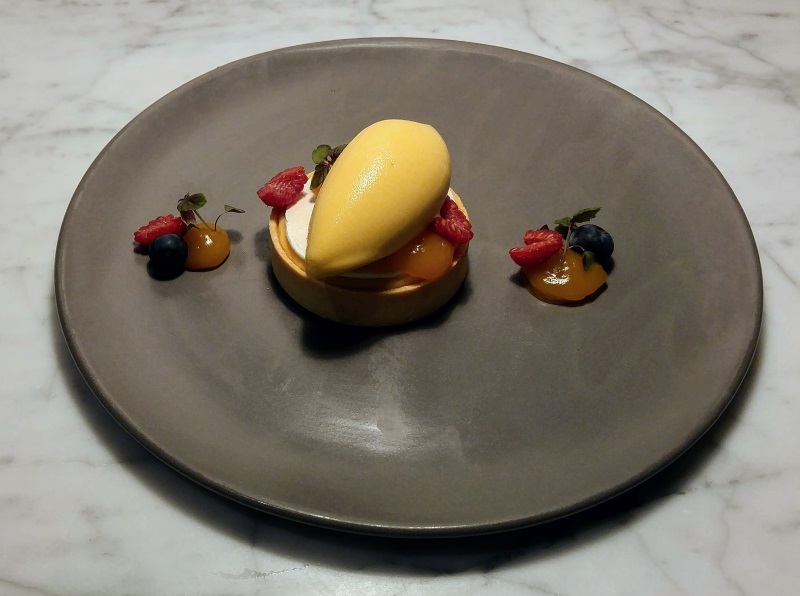 The tart was topped with a lemon sorbet or gelato that made a wonderful contrast to the crisp shell of the tart and the citrusy filling. The plating speaks for itself, making this officially the "fanciest" thing that I've ever had served to me; a feast for both the eyes and the palate. One thing I really like about Australian treats such as this (and the chocolates we tried, as well) is that they are less sweet than almost anything we usually find at home; in my view, this allows much more flavour to come out, and contributes greatly to the enjoyment of the treat. In this case, the bit of sweetness worked extremely well with the tartness from the lemon, making a perfect experience for both of us. Taken together as a whole, the meals and the foods we tried at the Pier One Sydney Harbour covered a nice range of what Australian food has to offer; we found everything to be delicious, and could not have asked for better. This concludes my series on our experiences dining out in Sydney; as you can see, it was not in the least a proper review, nor was it expertly written. In spite of the fact that it is 100% honest, this series is long on praise and short on criticisms, and that is deliberate. Our trip to Sydney is one of the absolute highlights of our life together, so far; it ranks up there with our wedding, the births of our children and other milestones. It represents a time when we had an incredible amount of fun together and experienced so many new and wonderful things together. There were little problems here and there, both with the trip itself as well with the food; we took wrong turns, got on each others nerves and ran into other issues, but the over-riding memory was one of happiness, togetherness, fun, positive energy...and falling in love all over again. This series reflects that. Our stay in Australia was an amazing experience for both of us, and we always be grateful for the opportunity that was given to us so that we could be there. We will never forget this trip; in fact, we're already saving up for our return, hopefully next year. I hope that you've enjoyed reading about it as much as I have enjoyed writing about it - and if you ever find yourself in this magical city, you could do worse than try these establishments that I’ve discussed. On our return trip, we intend to visit them all, and to also hit a few that we missed.